Once you've played a couple of games with your starter deck and are familiar with its basic workings, it's time to take things up a notch. Deciding which cards you can remove and which need to be added can seem a daunting task, but hopefully this article will point you in the right direction. It is worth noting that this is only advice and that you should customize your starter deck to suit your playing needs - feel free to ignore any part of this article! Let's start with the dilemma pile. Each starter deck contains the minimum number of dilemmas (20) allowed in a legal deck. This means you must replace each dilemma you remove from your original dilemma pile with something else. 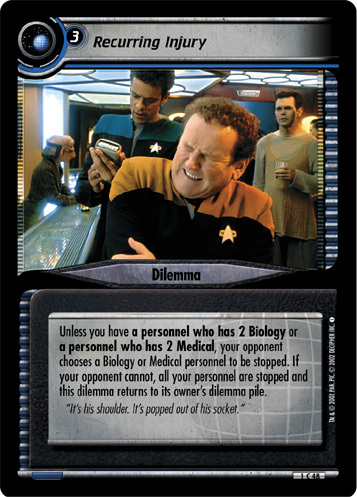 There is no upper limit on the size of your dilemma pile, but most players tend to have between 25 and 40 dilemmas, depending on their strategy. 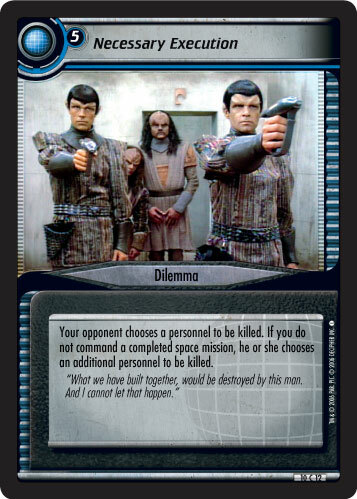 When picking dilemmas, one convention to follow is to try to remove at least one of your opponent's personnel from the mission attempt (whether by stopping, killing, capturing, returning to hand, ...) for each counter you spend on a dilemma. While this doesn't always hold true, it is a good place to start. 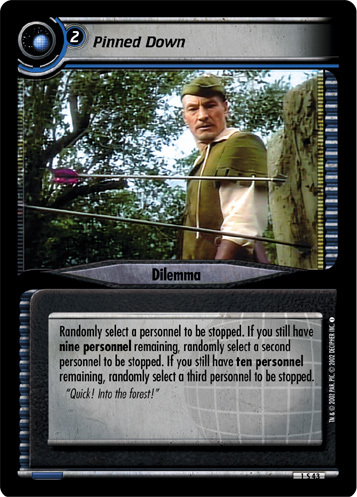 You can stretch this idea to use a two-cost dilemma for just one stop/kill/etc., but using a three-cost dilemma for this purpose isn't recommended, because you will end up having to use too many dilemmas to stop your opponent. Your aim should be to stop your opponent using the smallest number of dilemmas that you can. You'll notice several dilemmas in your pile that say "Unless you have a personnel who has 2 [skill A] or a personnel who has 2 [skill B], your opponent chooses a [skill A] or [skill B] personnel to be stopped..." If you were to play one of these dilemmas, an example of which is to the right, chances are that you will only stop one personnel. That's not such a good deal when you consider that most of these dilemmas cost three to play. Depending on which starter deck you purchased, that fact alone means there are at least four valid choices for removal. Another candidate is Limited Welcome. There are several dilemmas, such as Pinned Down (pictured left), that can punish an opponent for attempting a mission with more than nine personnel, so few players will actually take the risk. As long as you have Pinned Down, or one of the other similar dilemmas in your dilemma pile, you can get away with dropping Limited Welcome. The final candidates for removal are any duplicate dilemmas you might have in your dilemma pile. Having two or three copies of the same dilemma in your pile is a double-edged sword. It will mean you have a greater chance of drawing the particular dilemma when you want it, but it also means there is a greater chance you'll draw multiple copies at the same time. As you can never give your opponent the same dilemma twice in the same mission attempt, any dilemma that you draw multiple copies of is a waste. Following this advice could potentially remove ten dilemmas from your pile, so you'll need some other dilemmas to replace them with. The list of suggested physical cards (as opposed to the virtual card suggestions that follow them) below are grouped by expansion and only contain relatively easily obtainable common and uncommon cards. You don't need to use them all, so you should pick the ones you have available to you. Many existing players will probably have extra copies of these cards, so please refer to Part 9 of this series for advice on "Joining the Interstellar Community" if there are any that you don't have but would like to obtain. From Premiere: Captain's Holiday, Center of Attention, Chula: Echoes, Chula: Pick One to Save Two, Dangerous Liaisons, Temptation and Trabe Grenade. From Energize: Disruptor Accident, DNA Security Scan, Picking Up the Pieces, Racial Tension and Telepathic Deception. From Call to Arms: Confined to Quarters, Dressing Down, Murder Investigation, Rogue Borg Ambush (pictured right), Secret Identity, Skeleton Crew and So Many Enemies. From Necessary Evil: A Devil Scorned, Alluring Spy, Back Room Dealings, Cave-In, Guess Who's Coming to Dinner?, In the Way, Short Circuit and Test of Wisdom. From Strange New Worlds: Charged-Particle Precipitation and Outmatched. From To Boldly Go: Chula: Move Along Home, Cultural Differences and Warp Bubble Mishap. From Captain's Log: Compassionate Interference, Hull Breach, Last Gasp and Necessary Execution (pictured right). From These Are The Voyages: Barrier's Effect, Casualties, Excalbian Drama, Fesarius Bluff, Gangster's Welcome, Gorgan, Lawgivers and Vault of Tomorrow. From In a Mirror, Darkly: Aftereffects, Distraction (pictured right), Interphasic Effects and Preventative Repercussions. From What You Leave Behind: Chula: The Chandra, Inferiority, Moral Choice, Old Differences and Prefix Codes. The following expansions are virtual - meaning that you can print out the cards and add them to your deck. While you could use every dilemma in these expansions, some are more suited to new players than others. From The Undiscovered Country: Breaking the Ice, Curt Reprimand, Show Trial and We'll Never Know. From Favor the Bold: Chula: Unfortunate Roll and The Clown: On His Throne (pictured right). From Raise the Stakes: Echo Papa Attack, Full Complement, Miner Revolt and Occupational Hazards. From This Side of Paradise: Lending a Hand and Polywater Intoxication. It would take too long to explain why each of these dilemmas has been suggested. Some may work well for you while others may not, so it would probably be best to add a couple at a time to your dilemma pile and then try them out in a game. This trial-and-error method is a good way to build a dilemma pile as you can tailor it to suit your playing style. With the dilemma pile out of the way, we can move on to the missions and the draw deck. 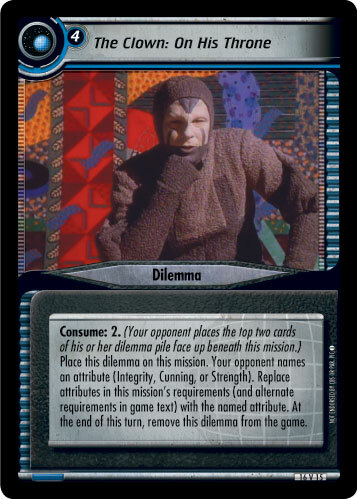 Each of the six starter decks will be discussed separately, should you wish to jump ahead: Borg, Dominion and Federation (Deep Space 9) can be found on Page 2; while Federation (The Next Generation), Klingon, Romulan and advice on general cards that you can add to any deck can be found on Page 3.